SELCUK, TURKEY—The highlight of this year’s Turkish camel wrestling festival was the battle between two hulking beasts: Samanyolu (Milky Way) and Tuncer. It started with the handlers leading the muzzled and ornately decorated animals—meant to resemble bridegrooms—into the fighting arena. The bold competitors were introduced, and then the tussling began, camel versus camel, two humped mammals trying to pin each other’s head to the ground. 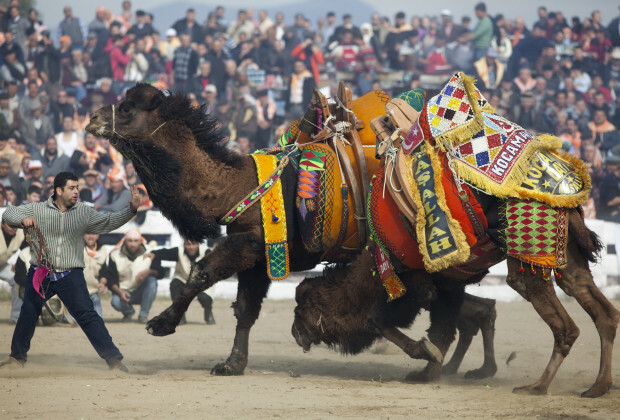 A pair of male camels fight during the opening moments of the Selcuk Efes Camel Wrestling Festival. First Tuncer tried nipping at Samanyolu’s legs. Samanyolu retaliated by using his whole weight to push back his foe, who lay motionless on the ground. But suddenly, regaining his strength, Tuncer stood up. The two giants faced each other, as if locking eyes would prove them equally strong. Then the time ran out and the match ended as most do—in a draw. Teams of handlers entered the ring, separating the fighters and pulling them away with ropes. 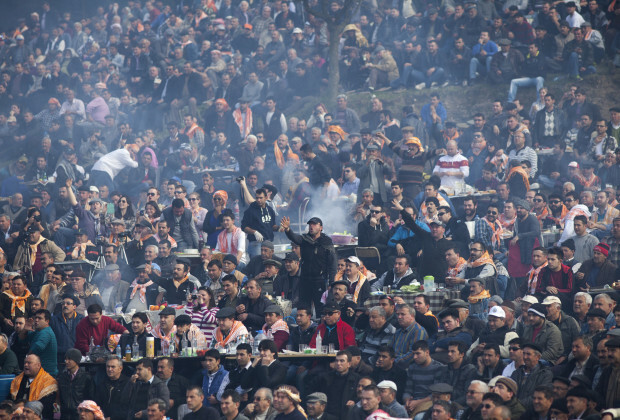 Through a thick cloud of barbecue smoke, fans celebrate after a match is called during the Selcuk Efes Camel Wrestling Festival. 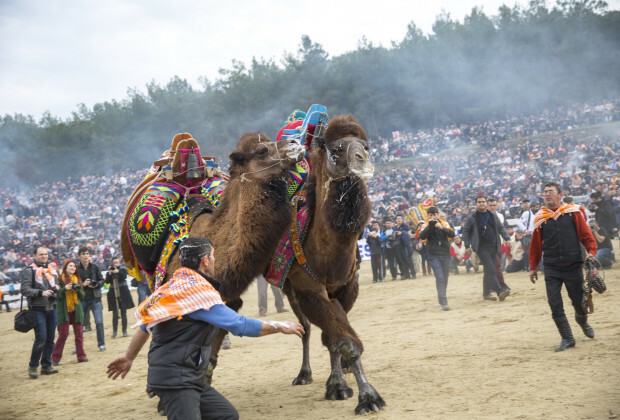 Inside a natural amphitheater on Turkey’s Aegean Coast, 20,000 people gathered at the 32nd annual camel wrestling festival in Selcuk. The event may have origins dating back thousands of years and replicates the competitions between horny, salivating males battling in the wild. Alper Efe (left) and Kocaman Dayi do battle. Camel wrestling is an old, nomadic tradition, according to Vedat Caliskan, assistant professor of geography at Cannakale University and the author of a definitive study on camel wrestling. “Two thousand years ago, they made drawings [of camels wrestling] on stone,” Caliskan says. 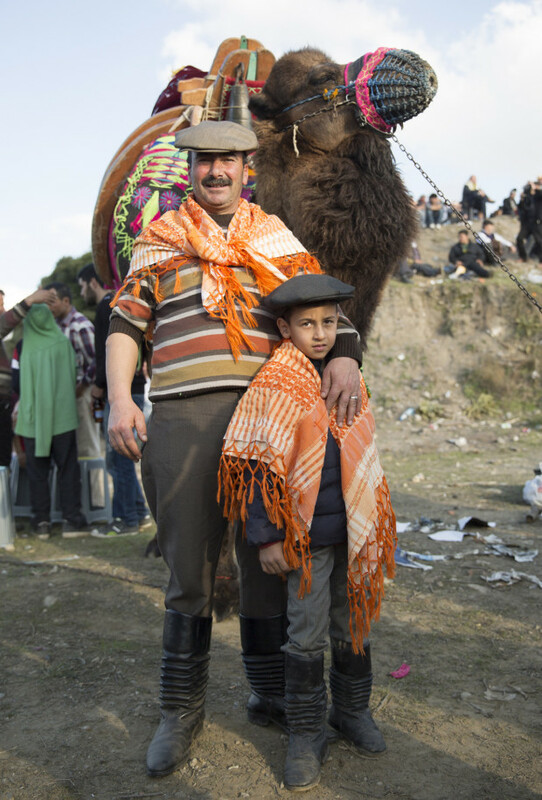 Omer Aksoy poses with his grandson Ayberk Mujdat, 9, in front of their camel. 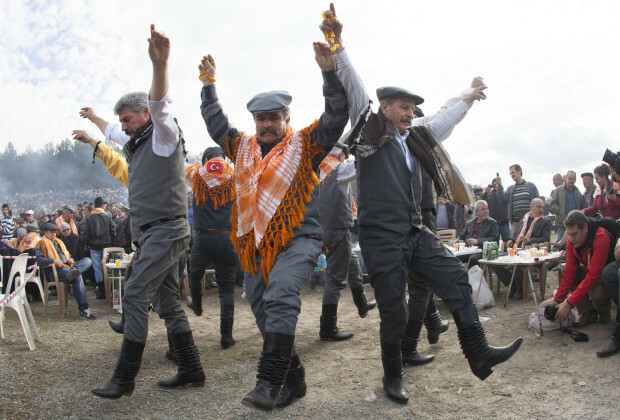 Many enthusiasts dress in traditional nomadic clothing, including special accordion boots, shawls and caps. 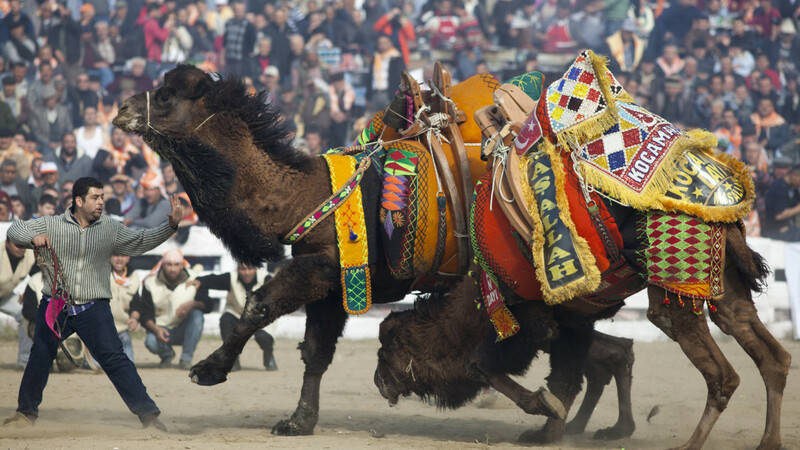 The Selcuk festival is the highlight of the camel wrestling circuit, which lasts for three months. It features the crème de la crème of Turkish camels. “If they can compete here, it’s a big honor for them,” says Kamil Tuncer, who owns eight camels. He says good camel costs $100,000. “But if they offered me $150,000, I would not take it,” Tuncer adds, his barrel-size chest bursting with pride for his namesake beast. 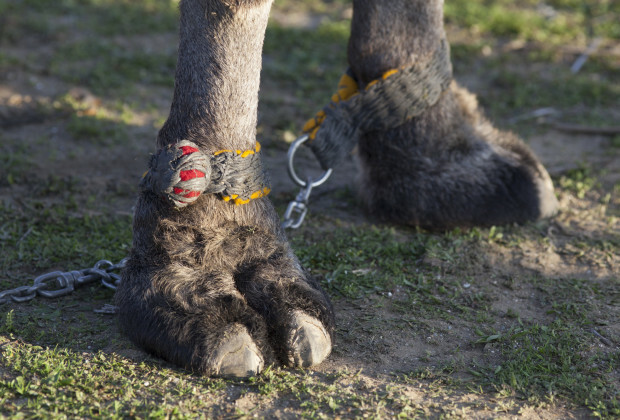 Camels can be ornery, so owners tie them by the feet to prevent them from running or kicking. What are the makings of a camel owner? “You have to be very rich and a little crazy,” says Cem Ozkan, a Selcuk hotelier and tour guide. This year’s event showcased 130 mammoth Tulu camels taking part in 65 bouts. Tulu are a hybrid between one-humped and two-humped camels, bred specifically for the game. The biggest ones weigh in at more than 2,000 pounds. 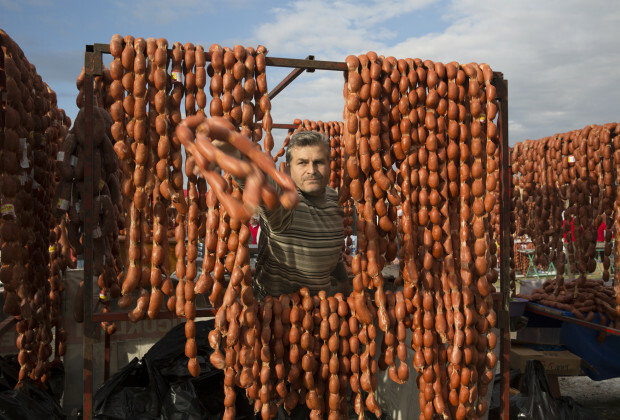 Butcher Serkan Varli tosses camel sausages to a counterpart for grilling. Unfortunately, losing camels are often sold as sausage meat. Camel sujuk sausage is a featured food at the tournament. Specialty butchers hang photos of dead camels in their shops to prove the meat’s authenticity. The spicy, testicle-shaped delicacies come grilled and served in sandwiches. Despite standing twice the height of an average Turkish man, the camels are cuddly and cute, with long eyelashes and plush fur. 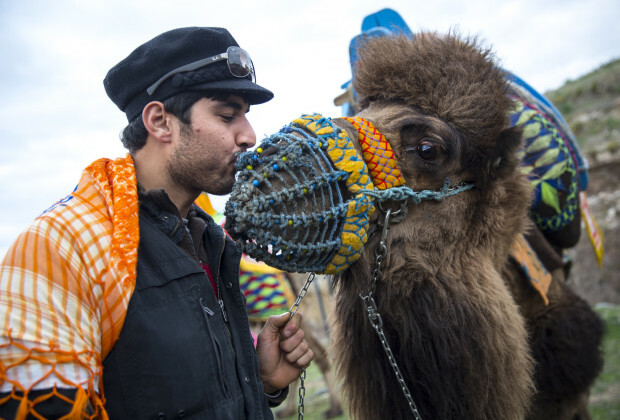 Ahmet Pala gives a kiss to a camel called Basharan before the tournament. Camel owner Mustafa Eyvas says camels are really sensitive and “more intelligent than humans.” But when they get ornery, they can be dangerous. The camel was brought to the butcher and made into soujuk. Efe (Aegean) dancers perform traditional steps at the edge of the stadium. 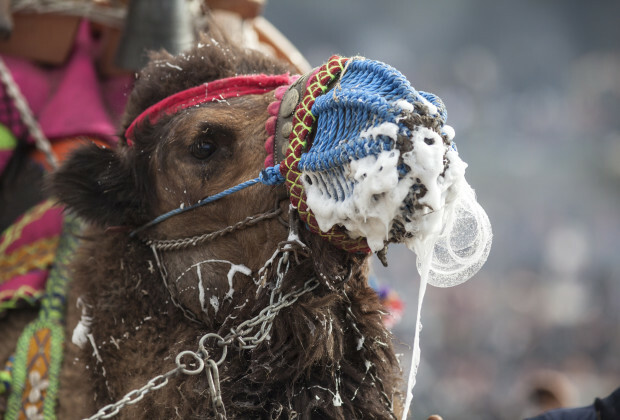 Some say the camel wrestling festival is actually a drinking festival. Thousands of men come toting raki (Turkish hard alcohol), barbecues, tables, chairs and picnic food. By early afternoon, many of them are tipsy or flat out drunk. 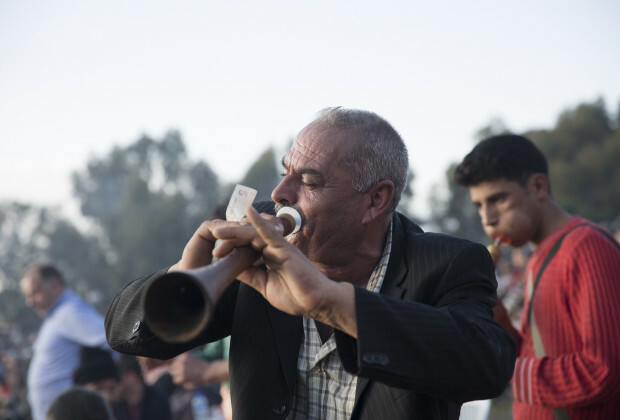 A Gypsy musician plays the zorna, a horn instrument. Teams of Gypsy musicians roam the fairgrounds playing traditional music, which incites people to dance, or sometimes to pay them to go away. Gypsy musicians work the crowd, banging on drums and playing a screeching zorna inciting people to dance. Some just pay them to go away. “It’s like a big tailgating party,” explains Eric Wyrowski, a Kansas City native and expat, while enjoying his fourth visit to the festival. 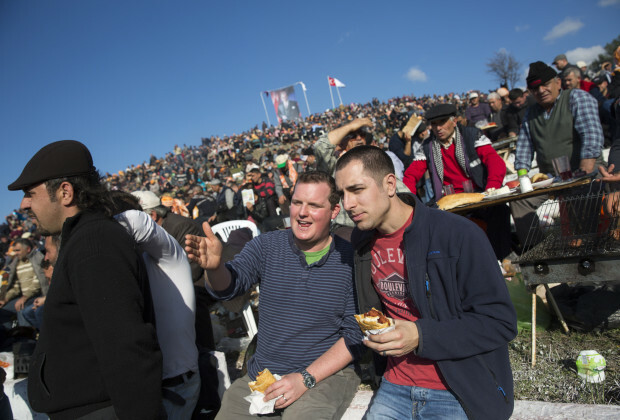 American expats Patrick Morse (left) and Eric Wyrowski at the Selcuk Efes Camel Wrestling Festival. "It's like a tailgating party," Wyrowski says. "You hang out with old guys who pass out and Gypsy musicians trying to revive them with zornas." A thick, bubbling saliva emerges from the mouth a muzzled male camel. The males typically froth at the mouth when they are excited. Either way, it’s pretty impressive in quantity. When the animals shake their giant heads, saliva comes flying in streams, covering the handlers and nearby spectators. Winning a match can happen in three different ways: One camel must get the other to scream, run away or fall. But after the allotted 10 minutes run out, most matches end in a tie. Sometimes the camels don’t even actually fight. 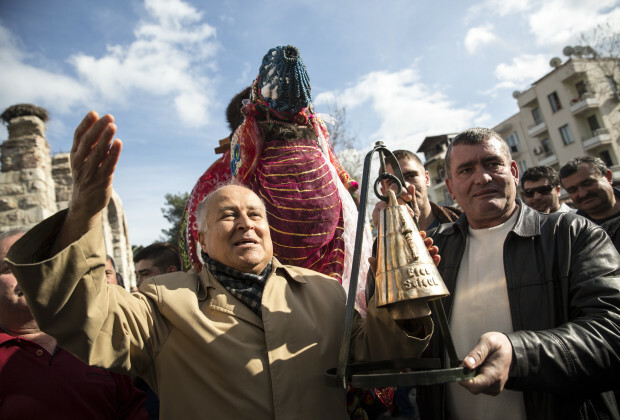 Owners celebrate the victory of their camel, Samanyolu, in the beauty contest, a new addition to the Selcuk Efes Camel Wrestling Festival.